Social Media disclosures are a difficult topic. For example, can you spot what's wrong with this Facebook post? "Comment on this post for a chance to win a $10 gift card!" "Looking for frugal fun this summer? Check out this post [weblink to third-party site]"
Distilling the guidance from these organizations isn't always the easiest. Suggestions are often written by lawyers, aren't updated often, and constructed in isolation from other governing documents. 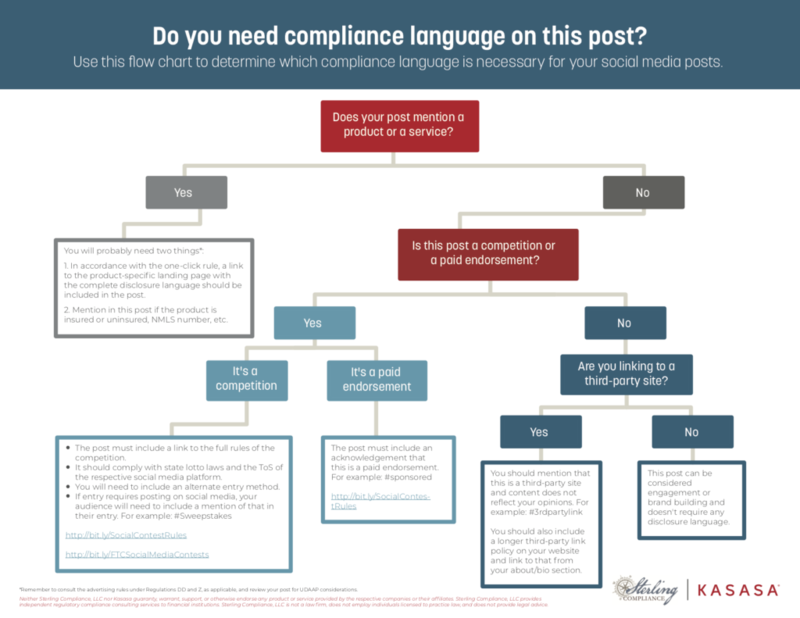 Being aware of all the potential disclosures you need to make on social media is overwhelming, which is why we worked with Angela Lucas of Sterling Compliance to create a simple visualization that would cover a majority of the social media content you share. When determining what disclosures you need to make in a social media post, there are a series of questions you'll need to answer. Does Your Post Mention a Product or Service? If your social media post mentions a product or service, you will likely need some disclosure language. Knowing what language to include depends on the product or service you are promoting. Below is a summary of some of the more common products you might be promoting and the regulation that applies. DDA: Truth in Savings Act/Regulation DD: Disclosure requirements designed to enable consumers to make informed decisions about deposit accounts. Regulation DD and Part 707 require disclosures about fees, annual percentage yield (APY), interest rate, and other terms. If an electronic advertisement displays a triggering term, such as “bonus” or “APY,” then Regulation DD and Part 707 require the advertisement to clearly state certain information, such as the minimum balance required to obtain the advertised APY or bonus. DDA: Deposit Insurance or Share Insurance: Whenever a depository institution advertises FDIC-insured products, regardless of delivery channel, the institution must include the official advertising statement of FDIC membership, usually worded, “Member FDIC.” Each insured credit union must include the official advertising statement of NCUA membership, usually worded, “Federally insured by NCUA” in advertisements. Loan Product: Fair Lending Laws: Equal Credit Opportunity Act/Regulation B3 and Fair Housing Act: Regulation B, prohibits creditors from making any oral or written statement, in advertising or other marketing techniques, to applicants or prospective applicants that would discourage on a prohibited basis a reasonable person from making or pursuing an application. A creditor must preserve prescreened solicitations disseminated through social media, as well as the prescreening criteria, in accordance with Regulation B. Loan Product: Truth in Lending Act/Regulation Z.: Regulation Z requires that advertisements in a clear and conspicuous manner. It includes requirements regarding the proper disclosure of the annual percentage rate and other loan features. Regulation Z permits providing the required information on a table or schedule that is located on a different page from the main advertisement. Character limits are a factor on all social media platforms and, fortunately, the FDIC recognizes this constraint and allows for complete disclosure to be on a webpage that is one click away. For that reason, we think it is a good idea to create product-specific landing pages. This page should focus on a single product, have minimal links to other parts of your website (especially not to other products or third parties), and include all the required disclosures. Link to this page, and only this page, every time you discuss the respective product. We recommend you consult the FFIEC's guidance and your compliance team when constructing both your product-specific social media posts and the landing page. Is This a Social Media Competition? Competitions are great for growing your following and engaging your audience. In fact, they can be more cost effective than ads in terms of increasing your reach. However, there are many rules that apply to social media competitions. FTC Rules: If you require a user to generate content to enter a contest (user-generated content or UGC), then that consumer must also include a disclosure saying that they generated the content as part of a competition or sweepstakes. The FTC says that including #sweepstakes or #contest in their entry post is sufficient. Thank goodness, right? State Rules: Make sure you know whether your promotion is categorized as a sweepstake, contest, or a lottery. It should never be a lottery. Contests and sweepstakes both require an explanation of official rules that include how you enter, alternate means of entry, conditions of entry, rule exceptions, odds of winning, judging criteria, the prize, the prize's value, and how the winner will be notified. ShortStack updates their recommendations every year and it is a great resource to reference in your planning. Before you launch your own competition, be sure to consult your compliance team and look at your state laws. Platform Rules: Each social media platform has a different set of rules. You should be very familiar with what type of entries they allow before you draft your promotion. Is This Social Media Post a Paid Endorsement? Whenever a person has an official relationship with the product or service they are endorsing, it needs to be disclosed. The most obvious example of this is a paid endorsement. However, there are other relationships beyond financial ones. For example, if an employee is posting about how wonderful a product is, they should disclose that they are an employee of the institution. If your PR firm makes a similar post, that relationship needs to be disclosed. The FTC suggests that including #sponsored is enough to inform people that there is a relationship. Are You Linking to a Third Party? You find a great piece that will resonate with your audience. Example: a post outlining 25 ideas to make extra money. You find content that strengthens and validates an idea you want your audience to understand. Example: a study that concludes banking with a community financial institution is good for the community. You're trying to build a stronger relationship with another business. Example: linking to a piece of content about a local businesses anniversary or recent award. You want to highlight aspects of your business, but don't want it to come across as bragging. Example: The local newspaper publishes an interview with your CEO. express opinions that don't align with your organization's views. In order to help mitigate these risks, you should always let consumers know when they are clicking on a link that goes to a third-party website. Using #3rdpartylink should communicate that this is to a website other than your own. In addition to making this disclosure, you should make mention that you link to websites that might not reflect the opinions or views of your organization in two places. In your about/bio section of the respective social media platform. In your official social media policy. Here is an example of Kasasa's social media policy.